Ticks are no laughing matter. Ask anyone who has acquired Lyme disease, Anaplasmosis, Rocky Mountain Spotted Fever, or any number of other tick-borne diseases, and they can give you a first-hand account on how such a tiny tick can inject humans with a serous and long-lasting illness. Anytime I take a group of friends or family on a hike, or to spend a day in the wild, I remind them “the most dangerous animal out here is a tick.” That, despite being surrounded by bears, wolves, badgers, and other predatory animals. Ticks are for real. Deer Ticks: The carrier of Lyme disease. Unfortunately, the very time we most like to be outside is also when ticks are the most active, creating a higher risk of getting bitten. Not only are tick bites annoying, but they can also be extremely dangerous to our health. From Lyme disease to the emerging Powassan virus, tick bites are nothing to take lightly. An investment in some tick repellent is money well spent! There are so many tick repellents available to choose from, figuring out which will be the best for you can be a daunting task. Some are going to be the same repellents you would use for mosquitoes (DEET repels ticks, too), while others are marketed largely for ticks. To make things easier, we’ve researched and analyzed several of them and put together the list of the best products on the market below. Our experience and research suggests that the best tick repellent isn’t a single answer at all — rather, it is a combination of two effective repellents. Use permethrin on clothing and footwear, and DEET on exposed skin. The overall recommendation? Don’t mess around with experiments or “maybe” repellents. Lyme disease is too serious to cut corners on. Go straight for the proven stuff, below. For exposed skin. This tick repellent has 25% DEET and will give you basic protection against both ticks and other insects such as mosquitoes, black flies, fleas, sand flies, gnats, chiggers, and many other ‘no-see-ums’. It doesn’t last for a very long time and according to the manual it’s highly recommended to reapply every few hours. 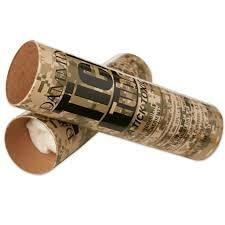 You can apply it on bare skin as well as fabrics such as nylon, cotton, or wool. For enhanced tick protection, the manufacturer advises to also spray your socks, cuffs, and other areas around your outer clothing’s openings that bugs might sneak in. However, we like treating our clothing and footwear with permethrin as well. This aerosol spray is easy to use and its advise for the best spread to apply it in a continuous sweeping motion. We like it because of its multi-purpose nature, and the fact that the bottle tends to travel well in backpacks, etc, without having mis-sprays. The only thing we would note is that if you are in a uniquely heavy tick area, you may want to go for the permethrin as well. Find here. For exposed skin. 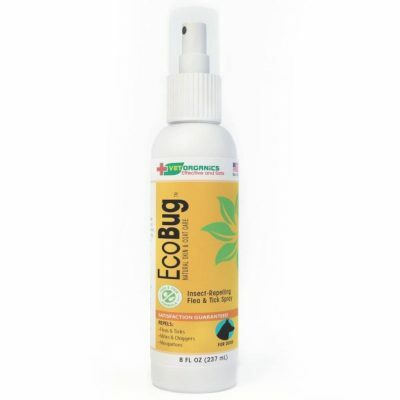 This one has more DEET in it (40%) and is one of the best sellers in the tick repellent category. Once applied, it is effective for up to 8 hours and besides ticks, it keeps fleas, mosquitoes, chiggers, gnats, and biting flies far away from you, your family and friends. It is recommend that you apply this product only on body parts that are uncovered. Of course, you can also spray it on fabric, but then you are left with the smell in your clothing for perhaps little benefit. Another thing to keep in mind is not to use it right after you’ve showered; wait a little while until you apply it in order to avoid irritation. The 40% solution (versus the 20-25% that is common) of DEET simply means that it will last longer than a lower-concentration product, providing protection for a longer period of time. Find it here. 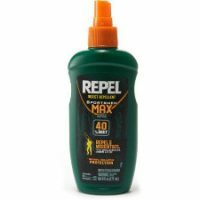 If you need a little extra boost or duration from your repellent, we also like Repel 100, a similar product but with a higher concentration of DEET. Now for the permethrin, the best choice for clothing, footwear, and gear. 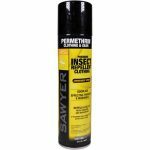 Sawyer Products makes perhaps our favorite spray for serious tick areas, using permethrin which is a highly-effective tick repellent. It also works on mosquitoes, so you get a bonus. We recommend this if you are going into an area known to be infested with deer ticks or other ticks, because in those areas you do not want to cut any corners — protect yourself from the ticks. 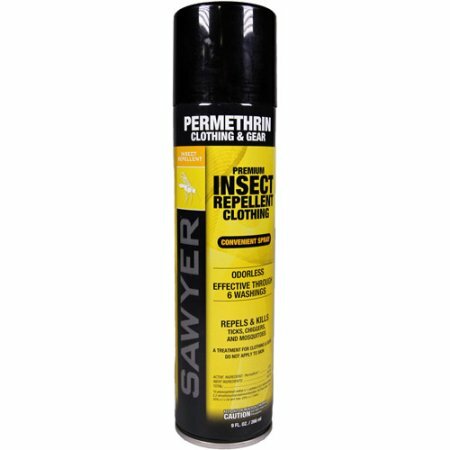 The main thing to know about the permethrin solutions is that they are not intended to be used to skin. Spray them on your boots, clothing, and gear, but we advise keeping your skin free of the chemical. DEET is better for skin. Sawyer also makes a 24 ounce pump spray bottle, with the same permethrin chemical, which is a little large to carry along on a hike, but great to keep in your vehicle if you find yourself in tick areas on regular occasion. We think this is an essential spray to have along if you are headed to ground zero of Lyme disease country, or the home to any number of other tick-borne illnesses. Use it on your boots, pantleg, and other gear. Find here. Permethrin and DEET are both effective in repelling ticks, but for different reasons and with different uses. Permethrin (not to be confused with the common mosquito repellent, picaridin) is a true insecticide that can repel, damage, or even kill small bugs. Humans can break down the chemical much easier, which is why we can use it but it is so effective on bugs. Still, it is not recommended you use permethrin on skin. That is why permethrin is best for applying to footwear, clothing, or gear to repel ticks. The only place we try to be careful about applying permethrin to clothing is when we will be in contact with lakes or streams, as permethrin may be toxic to fish (attention fly fishermen). DEET, on the other hand, is best known for use against mosquitoes. DEET is gentler, so to speak, because it never kills or really hurts insects. Rather, it confuses their sense of smell so they have a hard time locating us. DEET is OK to use on the skin. We recommend using both permethrin and DEET in tick-heavy areas. 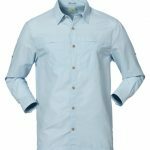 Permethrin on clothes and footwear, DEET on exposed skin. Note that after 5 washings, it is recommended that you reapply Permethrin to your clothing. If you want to err on the safe side, apply it more frequently. First things first, let’s take a look at what makes these products work. Ingredient-wise, DEET and Permethrin are the approved active substances found in most tick repellents. 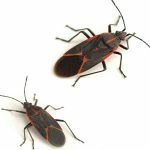 They are both efficient in keeping insects away without damaging your health (based on testing done to-date). However, If you want to go for a more natural repellent, organic ingredients such as geranium, catnip, lemon eucalyptus, and citronella oils have been shown to keep ticks away to lesser but still effective extent. When in doubt, we would go straight for the DEET or Permethrin, though. We would never want to advise you to experiment with something that was not effective in the field. You need more DEET to keep ticks away than for typical mosquito protection. Keep that in mind. Permethrin generally seems to be more effective at keeping ticks away than the more classic bug repellents like DEET, but it is not meant for skin. Use on your boots, shoes, socks, and pants for best results. DEET, on the other hand, is approved for use directly on skin. While some DEET is absorbed through the skin, it tends to be a very small amount. Using DEET along with sunscreen, and while drinking alcohol, may increase the amount that is absorbed. The research is still evolving, but there is enough evidence to suggest that you should be careful when mixing DEET and topicals like sunscreen, or DEET and alcohol. When choosing the tick repellent for you and your family, you must consider the concentration of the active ingredient found in the products. 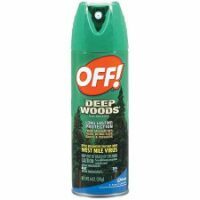 You’ll find various repellents have different concentrations of DEET, for example: from as little as 10% to as much as 98%. These numbers don’t actually indicate the protection’s effectiveness; they indicate the amount of time until you need to reapply the product. Products with low percentages are effective for perhaps a couple of hours, while others with higher percentages can keep ticks away for up to 12 hours. However, some studies have shown that you want to use at least 25% DEET solutions for the best results against ticks, but they should be reapplied every 4 hours or so. Mosquitoes are a different story — they can be kept at bay with small amounts of DEET. For the majority of adults, a percentage of 25% to 30% of DEET offers suitable protection. Of course, it depends on how much an individual sweats, if he or she has been out in the rain, swimming in a pool, and so on. In order to apply your repellent efficiently, follow the instructions written on the repellent’s package. For most children, the recommended maximum percentage is usually 30%. Keep in mind that the American Academy of Pediatrics doesn’t recommend using any type of repellent on infants who are younger than 2 months. Don’t forget to reapply. Repellents wear off after a while, and their effectiveness is best just following application. Reapplication tends to be more important for ticks than for mosquitoes. 4 hours tends to be the maximum amount of time to go without re-applying. Keeping ticks away is definitely not a mission impossible. With a great tick repellent and following the recommendations we discussed above, you’ll be able to fully enjoy the warm weather and the outdoors without earning any nasty tick bites. Even if you have been using the combination of permethrin and DEET, you should always check yourself for ticks after being outside in a tick area. It just takes one tick to hitch a ride on your clothing or skin, and you could be bitten. Note that when it comes to children and DEET, the American Academy of Pediatrics has issued some guidelines to follow. Children over the age of two should use a maximum of 33% DEET. DEET is not recommended for children under the age of two. When and Where Should I Use Tick Repellent? 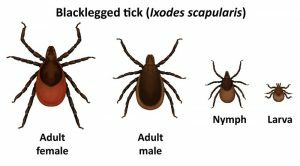 Ticks can be active during much more of the year than people assume. The typical range for activity is between March and November, with heightened tick activity in the spring and fall. 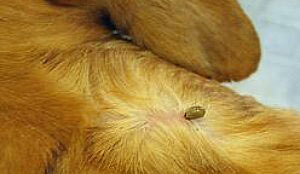 However, ticks can really be active on any day when the temperature is above freezing. They can be found in nearly any environment including yards and parks, but we find them most often in areas with longer grass, brush, and trees. Definitely take precautions if you will be camping, hiking, or exploring nature in a known tick area (which is expanding each year).